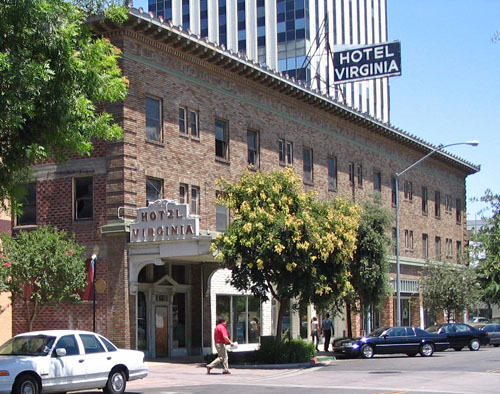 The Hotel Virginia is an excellent example of a working class hotel, of which numerous examples once lined the streets of San Joaquin Valley towns. The Kern and Inyo Street elevations are faced with a narrow brick laid up in a common bond that has a textural contrast created not only from the gradations in color of the brown bricks themselves, but also by the use of quoins and inserted decorative elements. Of interest is that the side and rear elevations are of red-colored brick laid up in Flemish bond. A particular character-defining feature of the hotel is the sheet metal marquee/portico over the hotel entrance, which is supported in place by decorative sheet metal brackets.